Moral discernment reflecting Christian values and a commitment to social justice are two of the key principles in Saint Joseph’s University’s mission statement. Recently, 14 students fully emulated these values when they embarked on an immersion and study tour of health care facilities in Nicaragua during the first week of January. The trip, which was led by Peter Clark, S.J., professor of theology and health services and director of the Institute for Catholic Bioethics, and Jean Smolen, Ph.D., associate professor of chemistry and director of environmental science, encompassed a seven-day study tour that followed a packed itinerary consisting of visits to health care centers, meeting with the members of the Jesuit Volunteer Community and speaking with locals about life in rural Nicaragua. During the semester prior to the trip, students were enrolled in “Just Health Care in Developing Nations,” a service-learning course which was held during the fall semester and included the immersion trip to Nicaragua. The course was taught by Fr. Clark and Ann Marie Jursca Keffer, M.S.W., associate director of the Faith-Justice Institute. *Pictured (Back row, left) Lucia Krahe ’13, Alison Tyrell ’14, Brittney Hurst ’14, Alexander DeBernardo ’14, Andrea Ito ’14, Caitlin Callaghan ’13, Chelsea Halat ’13, Fr. Fernando Cardenal, S.J., Jean Smolen, Ph.D., Peter Clark, S.J., Dominic Gatta ’14. (Second row, from left) Andrew Shaffer ’14, Tommy Nguyen ’14, and Katie Smith ’13. (Front row, left) Elizabeth Nemeth ’13, Marykate Roth ’14, Katherine McGovern ’14. Participants put their health care knowledge to use when they visited hospitals in Nicaragua, where they discovered that private hospitals have access to advanced technology, but public hospitals have extremely limited access to much-needed medicine and equipment. Experiencing these discrepancies in person allowed students to understand the vast differences between both health care systems. Lucia Krahe ’13, an interdisciplinary health services major, notes that in the public hospitals there were terrible odors and no air conditioning, as well as cracked floors that harvested bacteria. “The rooms were overcrowded with patients and their visiting family members,” says Krahe. Both Krahe and Callaghan agree that this experience gave them the inspiration to help provide medical care to third world countries. In addition to visiting hospitals, the students also met with representatives of Nicaraguan Haciendo Oportunidades Por la Educacion. This group provides education and job opportunities to youth who would otherwise be forced to work in garbage pits, making less than two dollars per day. 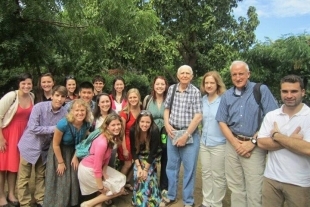 A highlight of the trip for many was meeting Fernando Cardenal, S.J., the former Nicaraguan Minister of Education. Fr. Cardenal’s commitment to helping the people of Nicaragua led him to start a Literacy Campaign in 1980 that successfully taught basic reading skills to more than half a million people.